Jeremy Corbyn’s challenge for the leadership of the Labour Party has spooked the neo-liberal political elite that have dominated Labour since the days of Neil Kinnock. For the last two months Corbyn and his supporters have been patronised and ridiculed by all manner of Blarite and Brownite luminaries. 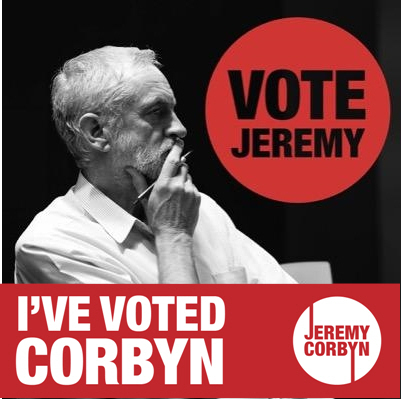 Now the latest opinion poll has shown that he has the potential to win the leadership election outright with over 50% of the first preference votes, massively defeating Andy Burnham and Yvette Cooper. 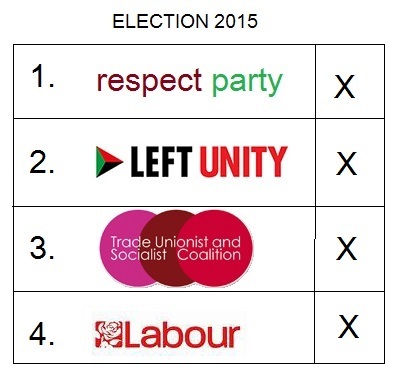 The crypto-Tory, overtly Blairite candidate Liz Kendall is forecast to come last with a humiliating tally. Labour’s neo-liberals are desperately trying to stave off humiliation by witchhunting those relatively few organised leftists formally outside Labour who have signed up to vote. But there is nothing they can do about the many tens of thousands of newly energised left-wingers joining Labour either as members or supporters who do not have any such affiliations. This is not entrism; this is a mass movement that Miliband and Collins did not expect when they abolished the special voting privileges of MPs and invited the public to sign up as supporters. The outcome of the Greek referendum considerably exceeded the expectations of the SYRIZA-led coalition government that called it, as well as most observers. They were painted into a corner by their own conciliation of the neo-liberal leaders of Europe, faced with their humiliating ‘offer’ of a bailout in demand for further massive cuts in pensions and social benefits. The SYRIZA government was faced with what in effect was an attempt to force a recently-elected government out of office; Alexis Tsipras turned to the Greek working-class masses and asked for their backing. Their courage in resisting the demands of the Troika far exceeds that of their left-reformist leadership. This was shown by the immediate aftermath of the 61% landslide victory of the ‘OXI’ (no) side, despite the NAI (yes) side having the backing of the entire privately-owned news media, with an avalanche of mendacious propaganda and disinformation. The no vote took place in the context of international blackmail, and the squeezing of Greek finances which has led to the closure of banks and a limit of €60 per day on withdrawals from ATMs, on top of the years of ‘financial waterboarding’ austerity and the severe impoverishment of much of the Greek population. This heroic defiance takes place in economic siege conditions whose clear aim is ‘regime change’. But in this case it backfired. This is the leading article in Communist Explorations, no 2 (Spring-Summer 2015). It is partly adapted from an earlier article on the immediate post-election situation, but contains much newer analysis. 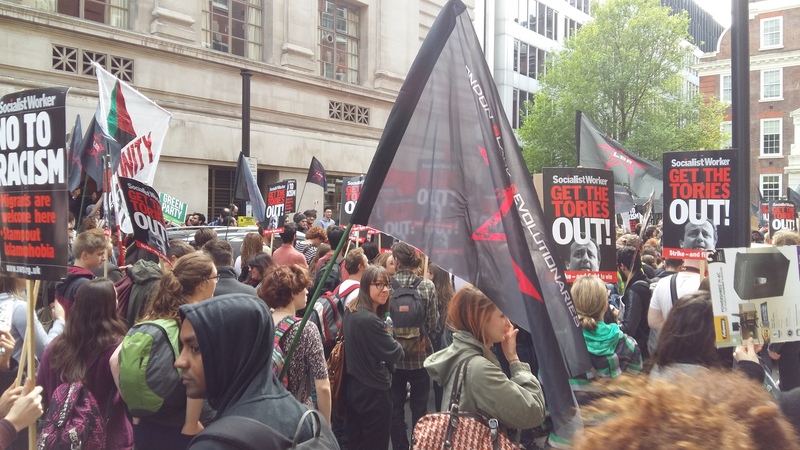 The anti-austerity demonstration on 20th June takes place after a historic defeat for the working class in the UK, which last May’s general election outcome represented. There has already been a beginning to social protest by youthful sections of the working class against the new Tory government. The 4000 strong London demonstration on May 9th, which was unsurprisingly pushed around by the cops, demonstrated that. The advent of a unalloyed Tory government, minus the discarded and destroyed Nick Clegg and his Lib Dems, whose project is to declare war against all of the remnants of social security and post-WWII gains of the working class that Thatcher failed to smash in her offensive in the 1980s, as well as against migrants and refugees, will force the working class to fight back. It is imperative to resist the new Tory government both in terms of economic struggle and on the political level. Political resistance is even more crucial than merely ‘economic’ resistance, as without a political movement behind them that is capable of addressing all the problems of society and all ruling class political stratagems, and putting the political arguments for solidarity to the entire working class, economic struggles will likely be left isolated as they have been in the past. I am taking the liberty of republishing this, not because I agree with everything in it, but because it contains a great deal of profound material that Marxist critics of Zionism and its supporters, Jewish and non-Jewish, in the advanced capitalist world, ought to find invaluable. 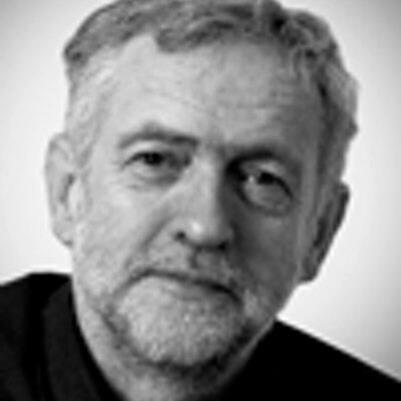 The outcome of last Thursday’s general election victory represented an historic defeat for the working class in the UK. That seems like a startling statement, as it was only a parliamentary election after all, and the class struggle is not won by electioneering. That is a Marxist truism that is worth bearing in mind in most circumstances. But sometimes election results highlight trends on the ground in a very dramatic manner. There has already been a beginning to social protest by youthful sections of the working class, against the new Tory government. The 4000 strong London demonstration on May 9th, which was unsurprisingly pushed around by the cops, demonstrated that. The advent of a unalloyed Tory government, minus the discarded and destroyed Nick Clegg and his Lib Dems, whose project is to declare war against all of the remnants of social security and post-WWII gains of the working class that Thatcher failed to smash in her offensive in the 1980s, as well as against migrants and refugees, will force the working class to fight back. But we had better be aware of the real significance of current events on the relationship of class forces, as part of preparing the working class on a wider level to resist. The current General Election is taking place in conditions where British politics is in a state of more flux and fragmentation than not only in the lifetimes of those generations alive today, but also of previous generations. In some ways it is unprecedented: there are no apposite comparisons in the history of British capitalism. Both major parties, the Conservatives and Labour, are at such historically low levels of popularity that it is hard to imagine that either of them are likely to be able to achieve an overall majority in parliament even though we have an undemocratic first-past-the-post system that is biased to giving the party with a plurality of votes a crushing, undemocratic overall majority in parliament. It could not be absolutely ruled out that either party might just make it as a result of some event stampeding voters in either direction, but it is not something most people would like to take a bet on.